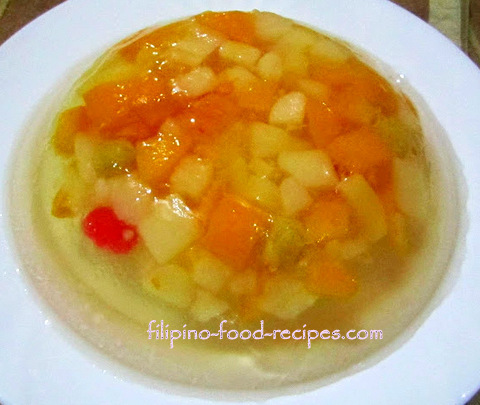 Lychee Gelatin Salad is molded gelatin with canned lychee fruits and canned fruit cocktails, a refreshing dessert served as it is or with evaporated milk. I use a lychee flavor gelatin pack which gives the extra lychee punch, but sometimes, if that is not available, I go with the unflavored gelatin and add the lychee syrup. I substitute some of the water in the recipe with the liquid in the canned lychee, but I cut back, about 1/2 to 3/4 cup of the sugar because the syrup is already sweetened. 1 Drain the canned Fruit Cocktail and Lychee in a strainer and cut the lychee fruit to desired chunk sizes and set aside. 2 Dissolve the gelatin packet in water. 3 Stir in the sugar and bring to a quick boil to dissolve the gelatin and sugar, turn the heat off. 4 Arrange the fruit cocktail and lychees in a decorative mold, if available. Try to have the cherries at the bottom so they would be visible when mold is inverted. 5 Pour the gelatin into the prepared mold and cover with a plastic wrap. Refrigerate until firm. 6 Invert the mold on a serving platter and leave it there until the gelatin releases itself(about 15 minutes or so). 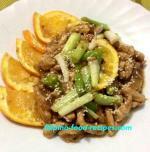 7 Serve cold as it is or with some evaporated milk poured on top.